A brief interlude as I talk about my sudden foray into Feast, a celebrated restaurant here in Houston. 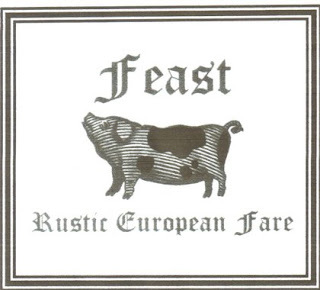 Much as been said recently about Feast, including a review by Frank Bruni in the New York Times, which was catapulted this young establishment into national attention. I was spontaneously invited to dinner there last night, with a crowd of fellow food enthusiasts, two of whom are already established fans of Feast. On a weeknight, the place had a casual feel to it, akin to a rustic British pub, dark wood tables, and nice paintings. I wouldn't have been surprised if a local knight strolled in inquiring about room in the inn upstairs. Unfortunately, I didn't take photographs, as I didn't have a camera with me, and besides, most of the dishes were eaten within seconds of the plate resting on the table. 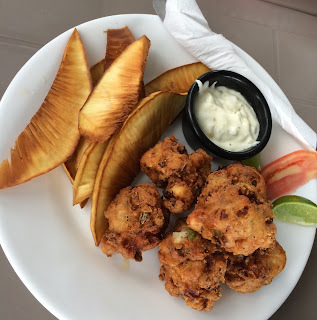 The menu at Feast rotates regularly, and our waiter wasn't shy about making recommendations. Much has been spoken about the bread at Feast, and this is my first opportunity to sample it. Served with some warmish butter (in misleading containers that make it appear that they contain more than a pat of butter), the breads were dense, and had a pronounced sourish flavor, but a pretty closed crumb. Served cold, I liked them well enough as being above average for bread served in Houston - but not particularly fantastic. I think the standards for bread is just so low in most places in town (maybe in general in America, compared to the norm in places like Germany and Britain) that these slices are hailed so strongly. For appetizers, we got the pork cheek and dandelion salad, some brawn with picallili, and off the menu chicken cracklings. The chicken cracklings were savory, crispy chips of meaty umami and salt. The brawn was described as being the tastiest head cheese ever - if you like head cheese. Personally, I really liked the pork cheek and dandelion salad. Very nice complementation of textures and flavors. Main courses - I ordered the beef tongue with root vegetables (which turned out to be carrots and parsnips), and other dishes ordered included some lamb and pork belly. I also ordered a side of roasted brussels sprouts to try them out. The sprouts were quartered before being cooked in an appropriately hot oven so that you get these caramelized spots. An ample sprinkling of salt, and its a pretty tasty dish. I've had better, but these are more than serviceable. I'm not a big fan of lamb, but I can attest to the requisite gaminess of the lamb preparations. The sides were fun, nice crispy potatoes, and cabbage. The pork belly was cooked crispy on the outside, rich and porky throughout. What I tasted of it was a success - but I'll hold it up against a proper lechon kawali some time. The beef tongue was nicely prepared, mild, flavorful, tender (but still chewy)...although I thought two slices was rather miserly. The carrots were nice, but the parsnips were all over the place - a piece nearly raw, another practically mush, another too woody to cut with a knife. The broth was very flavorful, and I wished we had sopped it up with bread. Actually, we did, but we were getting full. I think I would have preferred a more reduced sauce rather than the jus poured over mashed potatoes - as it was, it felt like a shame to waste all the flavor. We ended the meal with some bread pudding and sticky toffee pudding. The bread pudding was again all right (after all, it started with good bread), but the sticky toffee pudding was the better of the two. The strong caramelized notes of toffee complemented the warm confection quite well, and it wasn't sitting in that usual pool of creme anglaise found in so many other restaurants. Overall, I liked the unpretentiousness of the place, and the good service, but I found the food still having rough edges that could be worked out. I have a feeling it'll come into its own, but I do need to investigate the maturation.